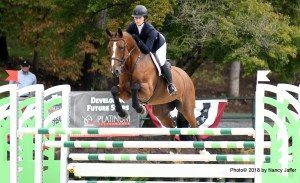 At the end of three phases of competition, 2017 ASPCA Maclay winner Maddy Goetzmann and 2018 North American Young Rider show jumping individual gold medalist Daisy Farish were 1-2 in the Platinum Performance USEF Show Jumping Talent Search Finals East. But it wasn’t over yet. 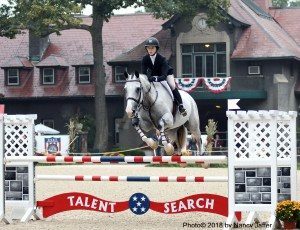 Yesterday’s flat and gymnastics segments–as well as this morning’s show jumping—each were won by Maddy, who looked as if she were gearing up to take the whole thing this afternoon at the U.S. Equestrian Team Foundation headquarters in Gladstone. Her total for the three phases was 421, to 406 for Daisy. The only segment left to contest was the Final Four, where the top quartet of riders started with a clean slate to compete over a shortened course, then rode the same route aboard each of the other finalists’ horses. While Maddy earned a 90 on her mare, Faemes Van T Poelzelhof (AKA Famous) Daisy got an 88 with Arsouille Des Etangs, the horse she brought to the party. So Maddy was still ahead at the end of round one. Maddy stayed one point in front of Daisy when each rode Cooper Dean’s Braavos. But the game changed in the third round when Maddy was on Arsouille, who cross-cantered, where the horse is on one lead in front and the other behind. Judge Ralph Caristo, who noted the young women had been “neck-and-neck” called the mishap “a slight bobble” but after everything was added up, that little mishap gave the title to Daisy by a single point. Last month was the first time that FEI World Equestrian Games has not used a Final Four format to decide its individual show jumping titles, but the other Talent Search judge, Chris Kappler, likes the concept continuing as part of this competition. “I can understand why they have taken it out of the WEG, because of such big jumping,” said Chris. Maddy and Daisy, who are close friends, held hands as they waited for the announcement about who had won, then embraced as they heard the decision. Daisy’s score in the final four was 349, to Maddy’s 348. “I knew it was going to be close, and I wasn’t sure which way it would go,” said Daisy, a 17-year-old high school senior from Kentucky. 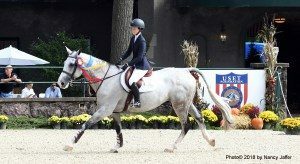 Maddy, who is coached by Stacia Madden and Beezie and John Madden, is headed in the next few weeks for the USEF Medal finals and Washington International horsemanship championship with her longtime ride, San Remo VDL. She isn’t sure if she will try the Talent Search again. Unlike the other finals, which are only open to juniors under 18, riders can compete in the Talent Search until they are 21. But she’ll be starting at Fordham University in September 2019, so what the New York resident does after that is to be decided. Lili Kaissar, fourth on a score of 309, is going to Vanderbilt University in the fall of 2019 and hopes to become an equine vet. The 18-year-old New Yorker was the only Final Four competitor who rode her own horse, Salt Lake. The dark brown gelding, who has an endearing habit of sticking his tongue out of his mouth as he goes around the ring, was named Best Horse of the finals. 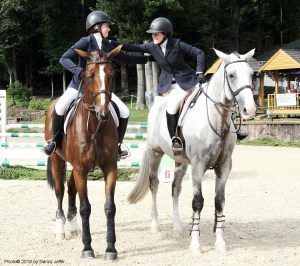 The other riders’ mounts were leased or borrowed for a class that goes above and beyond what is required in most equitation finals. That was reflected in the fact that there were only 33 starters this weekend, down from 52 last year. 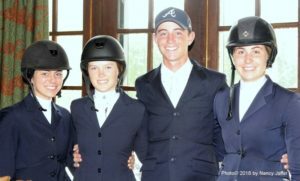 The idea of the Talent Search is to discover riders who have the ability to go on and perhaps someday represent the U.S. internationally, the way such previous winners as McLain Ward, Richard Spooner and Charlie Jayne have done. 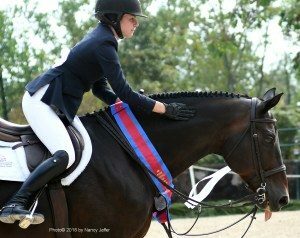 “I think the great part of this final is the people who have won it in the past, and just looking at where they have gone in their riding careers,” said Daisy, who emphasized that her life will include “something to do with riding” after she goes to college. 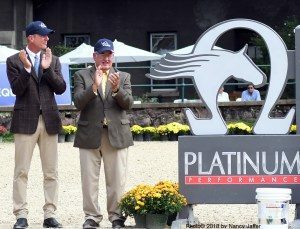 Frank Madden, who trains Lili with his wife, Jennifer, noted that in 1982, when the Talent Search began, the only other equitation finals were the Maclay and the AHSA Medal (now the USEF Medal). Then the Washington International Horse Show put in a final, and soon a host of other championships were on the calendar. “I think people have so many options and they made the standards of this more difficult than it had been,” Frank observed. Other trainers suggested lower numbers might stem from the advent of an easier option, the new USHJA jumping seat championship that has 3-foot, 3-inch fences, as opposed to the 1.20 meter (over 3-feet, 9-inches) that is the maximum obstacle height in the Talent Search, which also requires a water jump. In other years, we’ve often seen competitors who really weren’t ready for the Talent Search challenge. Some of them may have opted for the USHJA class this year. The riders who participated this weekend all rose to the occasion, without the unhappy outcome for some that has happened in other years. Stacia Madden pointed out that the sensible courses devised by Ralph and Chris were most welcome. The gymnastics at the Talent Search, for instance, had “historically been kind of a sticky wicket,” she noted, citing the fact that segment often relied on gimmicks. This time, it was more straightforward, including a serpentine of four fences down the middle of the ring, which gave the judges the opportunity to see “how their legs their hands, their seats, all work together; their eyes, using all their aids,” Chris explained.